A bonsai can be a tree or shrub grown in a container and therefore small in size, yet in its entirety expresses the beauty and form of a tree grown in nature. In creating a bonsai, the beauty of the entire tree and its harmony with the container in which it is planted are of aesthetic importance. Evidence of the existence of bonsai goes back as far as 1,000 to 1,300 years in China . Various essays and illustrations on Chinese and Japanese scrolls produced during the Kamakura period (1192 - 1333) indicate that suitable material was gathered from fields and mountains for creation of bonsai. It is during the Edo period (1615 - 1867) in Japan that bonsai gradually increased in popularity although it was viewed more as a hobby for the wealthy. 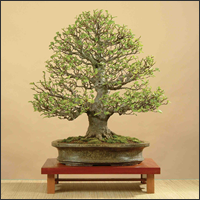 However, as interest continued to grow, bonsai became accessible to more of the public as a horticultural art form. In Japan this resulted in the first nation-wide bonsai exhibition being held in Tokyo in 1914. Since the 1930's and more especially since the late 1940's the interest in bonsai has spread from China and Japan, with the result that today, interest in the subject is now world-wide. Here in Britain , the few bonsai societies established in the 1960's and 70's have increased significantly in numbers. 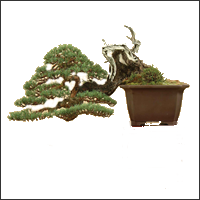 The growing interest in bonsai has resulted in the setting up of the Federation of British Bonsai Societies which, in turn, helped establish this, the National Bonsai Collection in 1991. Though established in 1991, it was not until 1993 that the National Bonsai Collection was officially opened by the Japanese Consul-General Mr. Yamazaki. This represented a big step in British bonsai, as it was the result of many years of hard work and fund raising to turn an idea into reality. One of FoBBS's (Federation of British Bonsai Societies) original objectives was to establish a national collection of bonsai, to bring together some of the finest trees in the UK. The collection is open not only for the dedicated enthusiast, but also for the casual visitor to the gardens to enjoy. A majority of the trees present in the collection have been donated or bequeathed, although a few have been purchased by the collection. A few trees on display during specific periods (ie. flowering) are on loan. The trees on display reflect examples of the different species and styles associated with this living horticultural art form. Day to day watering and care of the trees is carried out by staff at the Botanical Gardens. General maintenance of the collection is carried out by volunteers from local societies. More specialised training of trees owned by the collection and FoBBS is now carried out by a group of local expert volunteers. There is a continuous programme of improvements in the display area, including most recently, completely new podiums, designed by local craftsman Roy Cupples.